2018 marks a special milestone in Global Animal Partnership’s history as it celebrates its 10th anniversary! 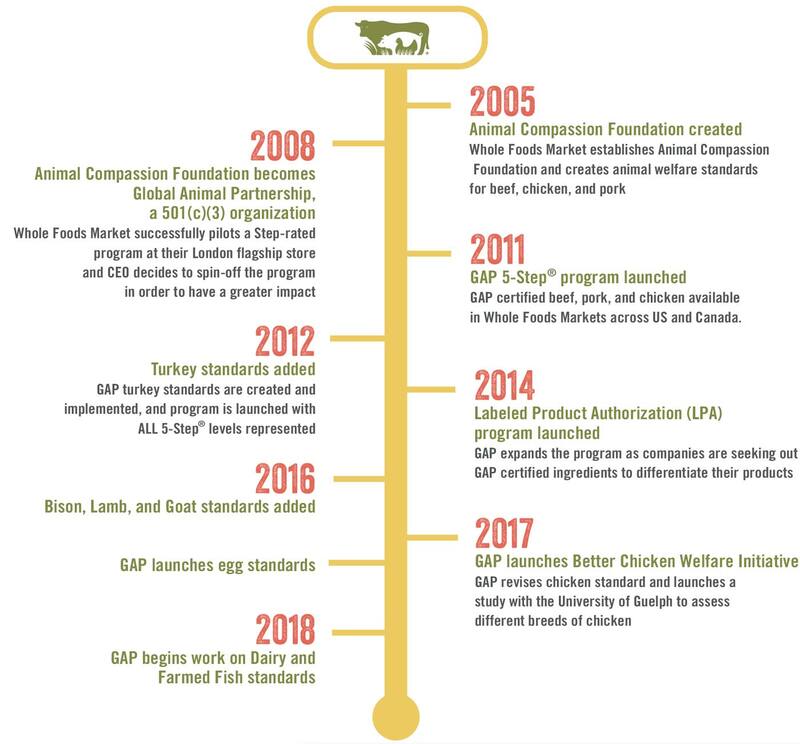 Since its founding in 2008, GAP has grown from a small grassroots farm animal welfare organization to now impacting over 290 million farm animals across the world. We’re proud to celebrate our successes so far, but still have so much more work to do to grow our program even further! It is an exciting time to be working in the farm animal welfare space as many more people, from retailers, manufacturers and food service companies, to farmers and consumers, are starting to make farm animal welfare a bigger priority. Over the past decade, we’ve evolved to much more than just a standards organization. We are here not only to provide a platform for change, but also to support our partners throughout their entire supply chains. While we do set standards and ask for farm animals to be raised a certain way, we also offer complete ‘farm to fork’ support, all designed to help our partners create sustainable, profitable practices that enable them to flourish for generations to come. Our goal is to be the go-to resource for industry and consumers alike who want to support a program that continuously improves the lives of farm animals Step by Step. For our partners, we’re a resource on animal welfare, while also growing more sustainable and profitable enterprises. For consumers, we’re a go-to resource for all things animal welfare rated meat. Meat protein from animals is not going away anytime soon, and we want to help guide you to make the best meat choices so you feel good about the meat you eat. Join us as we celebrate the impact we’ve made to date, as well as some of our pioneering partners, who are helping us improve the lives of farm animals around the world.